To place an order please pay 50% deposit by PayPal or bank transfer where we ask your name, address, email address. Please contact john@bluehanded.co.uk for any questions. Without this information we cannot process your order. We ask for a contact telephone number so we can contact you if there is an issue with your order. In some instances we may pass on your contact details if a delivery company needs to contact you. All international orders have to have a telephone contact number for delivery company purposes. Once we have processed your order and provided an order confirmation, we will prepare your goods for delivery. Your order confirmation will include a unique order number, please quote this number in correspondence with us relating to the order. We reserve the right to reject any order at any time. All products are sold subject to the specific product description. All reasonable care is taken by BLUEHANDED to ensure the product details and description are accurate when they are entered on to the system. Items described as ‘vintage’, are goods that have been previously used and may be 100 years old. The condition of these items is not new and therefore by nature they may show signs of wear or ageing. By agreeing to purchase such an item the buyer understands and accepts that the goods are not as new and may show signs of wear and ageing. The images shown are for illustration purposes only, occasionally the description may not be a true reflection of the goods purchased. Many products are photographed or shown with additional props, these are not included in the sale of the product. Please refer to product description for relevant information. Custom made items (including apparel, accessories, fabric by the meter, custom soft goods, upholstered vintage furniture, ) will be commissioned specifically for you. We will send you full details of the proposed work in an order confirmation. You must sign and date the hard copy of this document and return it to us by post. You may be sent fabric swatches or other relevant materials. If so please sign to confirm the selection and return it to us with the order confirmation. For all custom items we require a deposit of 50% of the total custom order value prior to work commencing. We will inform you when the goods are ready for despatch, and request payment of the balance due on the order. We will despatch the goods to you once full payment has been received. You may without charge cancel your order anytime up to returning the signed order confirmation. If you cancel the order after returning the signed order confirmation but before despatch of the goods, you will be charged a cancellation fee of 50% of the total commissioned order. However we cannot issue refunds on custom items once they have been despatched to you. 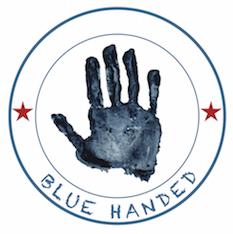 All copy, photographs, graphics, logos, illustrations and any text used in conjunction with any media from BLUEHANDED, in particular the contents of this website, are subject to copyright. Any unauthorised copying, will constitute an infringement of copyright.